Like a lot of amateur poker players, Steven-John Jost wanted to qualify for the 2018 PokerStars Caribbean Adventure to combine some poker with some Bahamian sunshine for a vacation. He ended up with way more than that. Jost qualified on PokerStars.com and wound up finishing 74th to earn $17,500 for his second career live cash. “For me, that’s big money. It’s great,” said Jost, who works in a labratory back home in Switzerland. 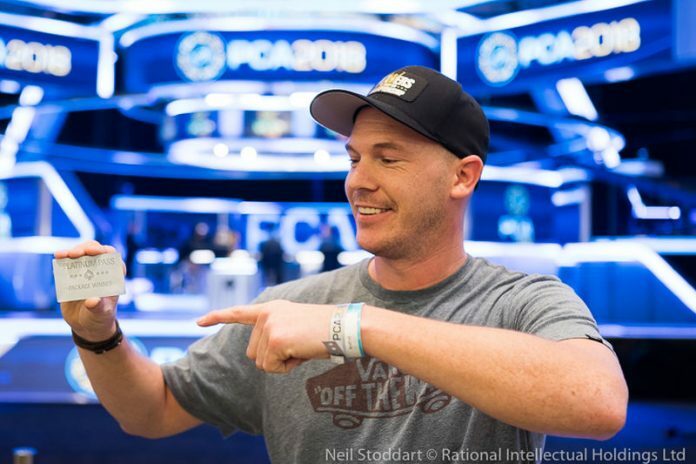 Like everybody who made the money at PCA, Jost had his name entered into a draw for Platinum Pass, the $30,000 package that includes entry to the $25,000 buy-in PokerStars Players Championship next January back in the Bahamas. As the final table was playing down to a champion on Sunday, Jost had his name drawn as the winner. “I was really shaking. Now I’m calm. I had to go for a drink and now I’m relaxed, just enjoying it,” Jost said a few minutes after having his Platinum Pass presented to him. PokerStars is awarding 300 Platinum Passes to players playing online, at live events and even fans who tune into PokerStarsTV live streamed events. Lots of players try to qualify for PokerStars live events on the cheap. Working their way through lower buy-in qualifiers before finally getting a shot at the final step. Jost suffered no such struggle. Jost only had one other previous live cash, but nothing like the PCA. Most of his live poker comes in playing with his buddies back home. Jost entered Day 1 of the PCA Main Event with a little bit of butterflies in his stomach, but they quickly disappeared. So for those keeping score at home, Jost paid $27 for a week long vacation in the Bahamas where got to play poker with some of the best players in the world, won $17,500 cash and a $30,000 package that includes entry to the PokerStars Players Championship next January. It sounds like it was a perfect trip, but Jost did have one complaint. “The only thing was the weather, it was disgusting. It was raining while I was playing, but when I was knocked out on Day 4, the sun was shining and it was really good,” joked Jost. All kidding aside, Jost knows just how fortunate he’s been throughout all of this since he first registered for that $27 qualifier and really hopes to keep the ride going through the PSPC.